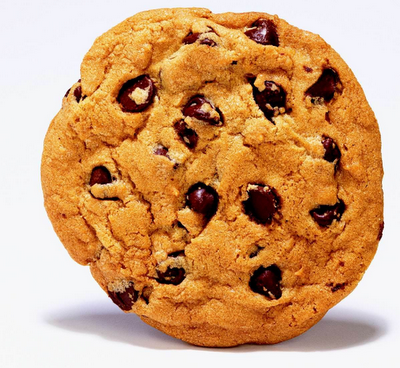 Chocolate Chip Cookie: The Mistake America Loves. When Ruth Wakefield ran out of Baker’s chocolate to make her chocolate cookies and decided to use pieces of a chocolate bar to finish the task, she never thought it would result in the creation of America’s favorite cookie. But it did, and the rest, so they say, is history. 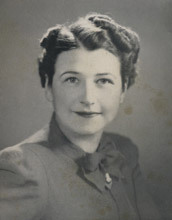 Ruth Graves Wakefield graduated in 1924 from the Framingham State Normal School Department of Household Arts, and for a time worked as a dietitian and food lecturer. 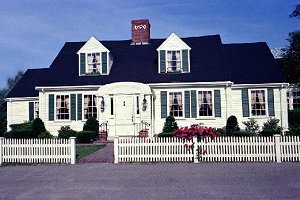 Then in the 1930s, she and her husband Kenneth bought a small bed and breakfast near Whitman, Massachusetts named the Toll House Inn, where she prepared the meals. Soon, Ruth gained a reputation with the guests and locals alike as a fantastic cook and exceptional baker. One of her more well known treats was Butter Drop Do cookies, in which the recipe called for Baker’s chocolate. One evening in 1937, while making this popular cookie, she found herself without the necessary chocolate so she decided to cut-up a chocolate bar given to her as a gift by Andrew Nestle and use it to finish her cookies. Mistakenly, she thought the pieces would melt into the dough to produce her delicious chocolate cookies. However, instead of melting, the chocolate pieces only softened. As the story goes, while Wakefield was disappointed in her little fiasco, the resulting cookies were “decent,” so she went ahead and served them to her guests. Needless to say, they were an instant hit. In fact, they were so well liked that more and more guests began requesting her to bake them during their stay at the inn. Soon Ruth Wakefield’s cookie, which she named the Chocolate Crunch Cookie, had grown so popular and the recipe in such demand that she allowed it to be printed in several New England newspapers. And as the popularity of Ruth’s new cookie increased, so increased the sales of Nestle’s semi-sweet chocolate bar. So much so that soon Andrew Nestle expressed the desire to print the recipe on its packaging. 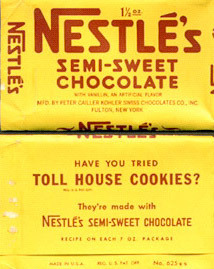 Then in 1938, Ruth and the Nestle Chocolate Company reached an agreement by which Nestle would print what was renamed the Toll House Cookie recipe on the back of the bright yellow Semi-Sweet Chocolate Bar package in exchange for a lifetime supply of free chocolate with which to bake her cookies. The Toll House Inn was built on the site of an actual 1709 toll house built on the highway between Boston and New Bedford, a prosperous whaling town. It was the place where coach passengers enjoyed a meal and short rest while the horses were changed and the toll was paid. The Wakefields operated the Inn until 1966 when it was sold. Ruth Wakefield died in 1977, and the building burned down on New Year’s Eve in 1984. It is estimated that 50% of all cookies baked at home are chocolate chip. The average American will eat about 35,000 cookies in their lifetime. Americans bake, spend more money on, and eat more cookies than any other nation in the world. The world’s record for the biggest cookie ever baked is held by a 102 foot wide chocolate chip cookie that weighed 40,000 pounds, or 20 tons.